Digital online uninterruptible power supply UPS GP9111C/GP9311C 6-40 kva ups is the latest models in SOROTEC. It is the collection digitization,informationization, network as one of high intelligent products, with powerful information acquisition system,signal processing system, detection system and perfect protection system. Widely used in all kinds of electricity environment, Personalized design, powerful human-machine conversation function. Visual display and state monitoring interface, make each user operate simply and conveniently. ■1ph/1ph or 3ph/1ph, support 380/400/415V, 50/60Hz power system. ■Pure-online double conversion technology, to provide the best quality of power supply. ■Suitable for all kinds of loads, and a high overload capacity. ■Super wide range of input voltage anti-interferance,adapt to harsh environment in power network. ■Intelligent battery management, extending the battery life. ■Large LCD display in Chinese and English, and Friendly human-machine interface. ■Double-conversion online design, make the output for 40 kva ups UPS frequency tracking, phase-locked regulator, filter noise, low distortion, without interference of pure sine wave power supply, so that online uninterruptible power supply UPS for user provide more comprehensive and perfect protection. ■Output conversion time, is zero to meet the sophisticated equipment for power high-standard requirements. 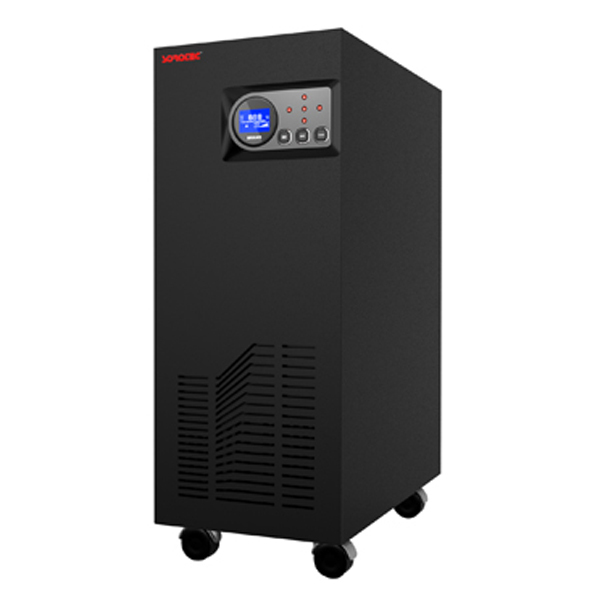 ■Machine the internal standard matches the output isolation transformer, anti-interference ability, environment and working conditions of information, user-friendly operation of the 40 kva ups UPS.To provide more comprehensive and perfect protection for the user ’s equipment. ■Tiny ground zero voltage difference, the power supply to meet the needs of the precision instruments to protect the safe operation of equipment. ■Good load compatibility, and can be applicable to various types of loads, to meet various needs of applications. ■ Wide voltage input range up to 304V-456V, avoid frequently switching to batter y power supply, adapt to the power environment in poor areas. ■Wide input frequency range of online uninterruptible power supply UPS, generators can be guaranteed access to a variety of fuel oil stability. ■Using intelligent battery management technology to extend the life of the battery and reduce the number of maintenance. ■Advanced constant voltage charging technology, maximum activation of the battery, charging time saving, to extend the battery life. English / Chinese (optional) LCD display panel, to the user to accurately display the working environment and 40 kva ups UPS status information, user-friendly operation of the online uninterruptible power supply UPS. ■Through RS232 interface and intelligent monitor software to communicate with the computer, and the various parameters of 40 kva ups UPS clear displayed on the communications interface. ■ External SNMP adapter, online uninterruptible power supply UPS with remote network management capabilities, providing real-time UPS date and power information through a variety of network operating system for communication and management. Online uninterruptible power supply as a backup power supply, by the battery, inverter, charger, voltage stabilizer, switch. When the normal input of the city electricity, 40 kva UPS will city electric voltage supply load, and the built-in rechargeable battery pack, the energy stored in the battery; when the city electricity interruption (blackout) or input fault, 40 kva UPS immediately the built-in battery energy conversion, instant to 220 V AC continue to used for the load, the load to maintain the normal work and protect load software and hardware are not damaged. Online uninterruptible power supply in the security monitoring system, not only can comprehensively improve the quality of power supply, of the whole system and network data comprehensive protection, guarantee power outages and man-made destruction of special circumstances, continue to work. Due to the security monitoring system for high power supply requirements, it is necessary to choose the online uninterruptible power supply (sine wave, city power requirements) . System equipped with 40 kva UPS power supply, first of all, we should estimate system equipment of electric power, safety coefficient is generally 1.2-1.5 is appropriate, for the power supply system left full redundancy. Second, according to the system requirements delay power supply time, the calculation of the battery pack. Finally, we should pay attention to the use of the environment, moisture and ventilation, focus on cooling, to extend the average time to work, improve the reliability of the system. Online uninterruptible power supply should be set in the monitoring room, the implementation of unified management. When the power is not normal, it will be able to provide uninterrupted power supply to all the equipment in time, guarantee the system to work normally, prevent the artificial destruction, keep the secret, and maintain the system. Security monitoring system is mainly used in the middle of all the systems of the various commercial buildings, school, hospital, school, bank, roads, etc., and these places importance on the public is very high, so in the process of selection and configuration of the emergency power supply should be very careful.